Dear friends, followers, and supporters alike! A few days ago, I received a package from my good friends Patrik and Mikael of "Selected Malts". The package turned out to contain their upcoming release, and although Selected Malts is a relatively new independent bottler (they released there first bottling roughly a year ago) this is actually their 10:th release so far! So congrats on a first year well done guys! This time around they are releasing an 8 year old whisky from Benriach distillery. The distillation date was 20100530 and date of bottling was 20181219. The whisky was first matured in a single bourbon hogshead (2nd-fill bourbon) and was then transferred into two 128 litre 2nd-fill oloroso quarter casks for a finishing period of 7 months. The whisky was bottled at cask strength of 52,2% ABV, no filtration and likewise no coloring has been done! The two casks gave 500 bottles in total and out of these 464 bottles will be released at the swedish state monopoly this monday (15:th of April) through the "order-assortment". You can view the whisky by clicking here. Ok folks, it's time to analyze! Although the sherry finish has not really made a mark on the color of this whisky, it has done so on the top layer of the nose; light/yellow raisins, the peel and dryness of red/purple grapes, and finally the inside of dried (but moist) figs. Below this layer I do however mostly find scents that I associate with bourbon cask; (the famous) ”excotic fruits” such as yellow kiwi, overripe banana and lemon peel. But, far more evident is loads and loads of creamy vanilla, melted butter, cookies, and pastry. In the very bottom layer we have more robust notes such as marzipan, mint, a hint of peaty-ness and in the distant butter drizzled ginger. Complex stuff folks! Well that was an interesting turn/surprise! It begins on light peat, saltiness, vanilla fugde and sweet liquorice! Slightly burnt custard sauce takes over which moves on into lightly roasted and sugared almonds. After that we have a beautiful wave of melted butter coming in, only to be interrupted by a dryness somehow reminding me of the leaves on a black currant bush. I can’t really seem to put my finger on the sherry influence, but something makes me think of perfume-y-ness, red and orange wine-gum sweets, and milk chocolate pralines filled with cherry-liquer. In the aftertaste, the vanilla, butter, and the light peat moves off and on into one another, and the whisky fades away on a slight dryness and a sugar-y sweetness. This was a very, very interesting dram to taste! The taste really differs from the nose and I did not at all expect the peat and saltiness to be in focus in the early phase of the taste. Also, I thought that the taste would have more of the ”excotic fruits” from the nose coming through. The strength is perfect just the way it is. Being a (kind of) single cask (before the finish) of this quality, the price level is amazing. And hey, the complex nose is alone worth the price of a bottle, so sláinte! Big thanks to Patrik and Mikael for the great opportunity to review this whisky before its release! For kind of weekly updates please make sure to follow my FB-page by clicking here, my instagram by clicking here, and my twitter-page by clicking here. Copyright © and All Rights Reserved on all tasting notes and text by SamuelWhisky and pictures and videos likewise belong to SamuelWhisky, unless stated. If you would like to use any such material that belongs to SamuelWhisky or associated with SamuelWhisky, please ask by sending me an email to samuelkarlssonorebro [at] gmail [dot] com and by stating the source. 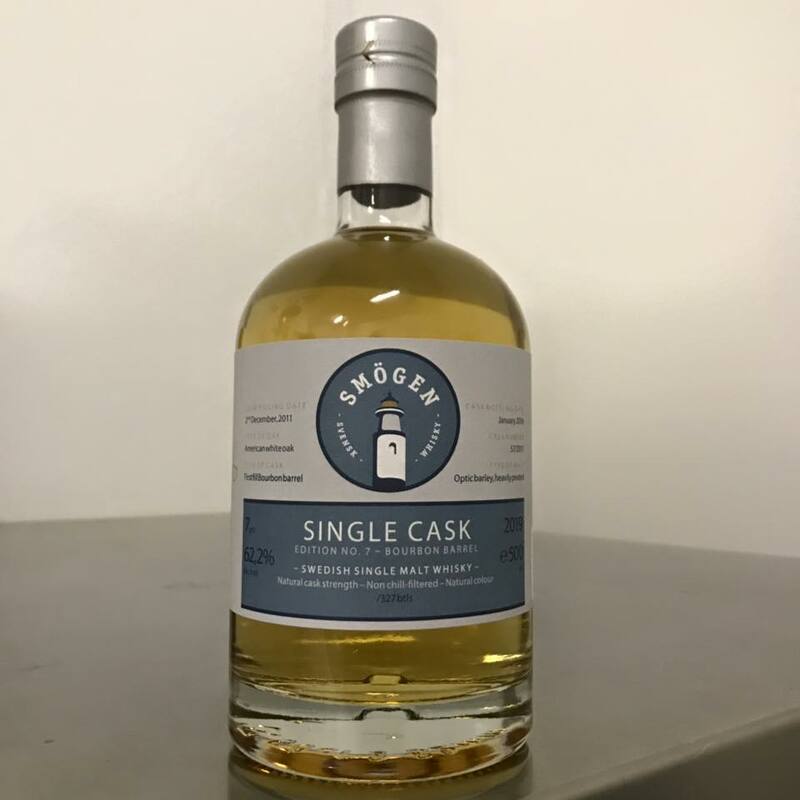 Swedish whisky from Smögen Distillery – Single Cask 56/2011 7yo 62,4% ABV! Dear friends, followers, and supporters alike, once again it's time for me to review yet another bottling from Smögen Distillery in Sweden! Just as with this one, I was very fortunate to pick up a sample during Linköping Whiskyexpo. Thank you Pär! So, the whisky up for review today is 7 years old. On the 26th of november 2011, Smögen new make made from heavily peated Optic barley was filled into a 1st-fill bourbon barrel (from Makers Mark) with the assigned cask number 56/2011. As Pär explains here, he discovered that there was risk of leakage (emergency solution needed); he made the decision to transfer the whisky into a rum barrel that had previously held Port Mourant rum from Diamond distillery (Guyana). And so, the whisky was given a rum finish lasting for 4,5 months. 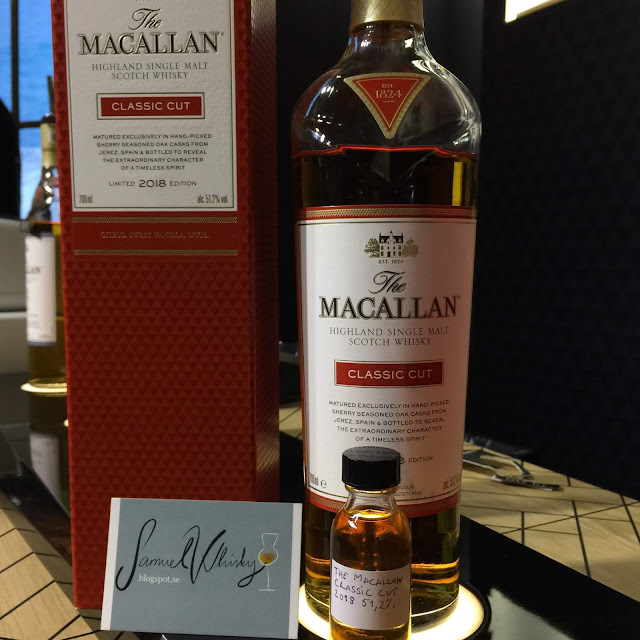 The whisky was bottled in January 2019 at natural cask strength of 62,4%. The cask gave 325 bottles and out of these 288 will be released this thursday (190404) at the state monopoly through a so called web-launch. Please click here to view the product. Ok folks, time to analyze! Aaaaah, an explosion of flavors (that is soo hard to keep up with)! We start off on both sweet and salt, and sweet and peaty. I swallow and instantly after that rum-raisin and a ”green”/vegetal vanilla flies by extremely fast. We move on into leather with bicycle inner tube floating around discretly somewhere in the background. I take another sip. The strength/ABV is absolutely beautiful as it is, and warms my chest immensly. The peaty-ness is definitely robust, fat and very full-bodied and has some kind of vegetal/herby touch to it. In the early aftertaste a creamy and chewy vanilla fills my mouth. The rest of the aftertaste is leathery, medium dry to dry, and leaves the front of my tounge particularly dry with a slight touch of swedish Punsch and the smoke from a slightly chocolate-y cigarillo. Friends, I must admit that I was actually a bit afraid that I would not like/enjoy this release. In fact, when sampling it during Linköping Whiskyexpo I actually warned Pär Caldenby that I do not very often like rum matured and/or rum finished whisky. However, with this particular release it has turned out that I had absolutely nothing at all to worry about. For me, this is the perfect rum finish; the rum cask has left a perfect mark on the whisky. This is because the distillery character of Smögen, with it’s beautiful peaty-ness, still shines through and is still very much there, meaning it has not at all been ”drowned" in rum. A very good whisky, and also a bit funny that an ”emergency solution” turned out to be so good! Finally, big thanks to Pär one again for the great opportunity to review this whisky before its release! For kind of weekly updates please make sure to follow my FB-page by clicking here, my instagram by clicking here, and my twitter-page by clicking here. Copyright © and All Rights Reserved on all tasting notes and text by SamuelWhisky and pictures and videos likewise belong to SamuelWhisky, unless stated. If you would like to use any such material that belongs to SamuelWhisky or associated with SamuelWhisky, please ask by sending me an email to samuelkarlssonorebro [at] gmail [dot] com and by stating the source. Dear friends, followers and supporters alike, SamuelWhisky is back with yet another review, and this time it's a whisky from the ever exciting Swedish distillery Smögen! When working the Linköping Whiskyexpo a little more than two weeks ago, Pär Caldenby (the Distillery Manager/Master Distiller of Smögen Distillery) passed by the Edrington stand, upon which I asked if he had any upcoming products that he wanted me to review. To this he replied: "I brought our two upcoming single casks, so just pop by". Believe me, those words were music to my ears. 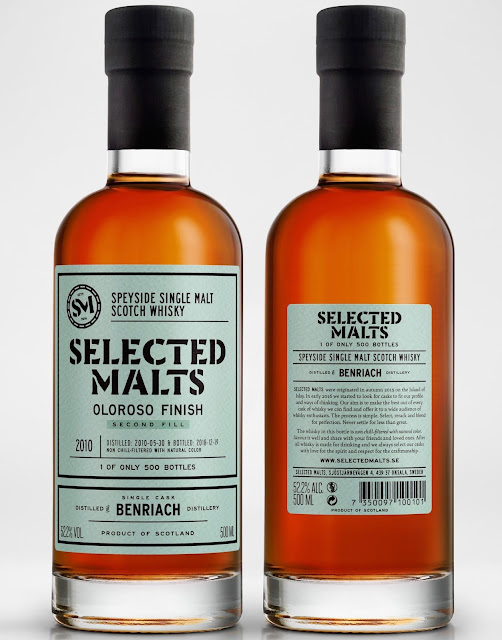 Now, the one of these bottlings that I share my tasting notes of with you today is "Edition no.7 – Single Cask 57/2011". On the 2nd of december 2011 an ex Makers Mark (1st-fill) bourbon barrel was filled with (according to Pär himself) nearly 200 litres of heavily peated Smögen New Make and left to mature until it was bottled in january this year, hence making the whisky 7 years old. The whisky was bottled at natural cask strength of 62,2% ABV. The cask gave 327 bottles out of which 288 will be released through a so called web-release at the swedish state monopoly tomorrow (the 28th of february). Please view the product by clicking here. Ok, let's see what we've got! When I pour a dram from the sample, and it gets some time to breathe in the glass, peat, soft vanilla and overtones of citrus immidiately spreads throughout the room. Doing some initial nosing after five minutes of airing, my nose says ”the ABV is high”, and I discover evident but mellow notes of orange peel and cut up slices of ginger, but, most of all a beautiful deep peat. It’s a peatyness that says sweat-y leather, and there is definitely more peat than there is ”smoke”. Furthermore I detect melted butter at room temperature (reminiscent of the swedish cookies ”kola kakor”), a chocolate bar swishes by (very light milk chocolate), and in the far distance there is freshly manufactured and wonderfully soft vanilla fudge. Even deeper in the scent is something slightly reminding me of a combination of on the one hand arrack infused with juice from overripe pears and on the other hand a slight touch of baking yeast simmering in luke warm water. While writing all of this I can’t help but noticing how many times my brain has thought: ”The peat-yness really reminds me of the peat-yness in a young and in-your-face Laphroaig!”. Mmm! Instantly salty and peaty in a beautiful mix! There is something in the saltyness that makes me think both of salt liquorice (hard candy) and of something violet-esque… very yummie! The strength does not at all get as much attention on the taste as it did on the nose. It seems to me that the main development of flavours happens in the ”middle registre” or layer of the taste, very malty, very chewy, very more-ish but quite quickly moving on into peated almonds and hay (meaning farmyard). And would you look at that, the violet returns! But most of all does the mellow notes of orange peel return, but this time drawing more on old lemon peel actually. The early aftertaste has a little punch and bite to it that kind of says black pepper. My mouth goes medium dry but then the waters/saliva starts flowing on and on… something leather-y in combination with a sweet cigarillo calls for attention and rises to the roof of my mouth at the end of the aftertaste. I wish that my skills to detect flavours on the taste were as good as my nosing skills. Or maybe in this dram the different characteristics of the nose is ”more developed” and mature than the characteristics of the taste? Pondering about this dilemma, I’d however say that this definitely is a very mature dram and at the same time I’d say that the taste of a bourbon matured Smögen might develope and become more complex with just a little more time in the cask. The future will show! Finally, as I mentioned this dram was very Laphroaig-y on the nose but on the taste it has more focus on the malty side of things. Anyways, soo very interesting to taste an, in the context, ”old” Smögen as this is; now it has reached such age that I actually don’t really think about the age anymore, and all in all everything starts to get very, very yummie! Well done Pär, well done indeed! Finally, big thanks to Pär for the great opportunity to review this whisky before its release! For kind of weekly updates please make sure to follow my FB-page by clicking here, my instagram by clicking here, and my twitter-page by clicking here. Copyright © and All Rights Reserved on all tasting notes and text by SamuelWhisky and pictures and videos likewise belong to SamuelWhisky, unless stated. If you would like to use any such material that belongs to SamuelWhisky or associated with SamuelWhisky, please ask by sending me an email to samuelkarlssonorebro [at] gmail [dot] com and by stating the source. Dear friends, followers and supporters alike! Finally it's time for me to review a whiskey from the guys at Teeling again! I have previously reviewed six releases from them (please click here to view them all), but now it's been a while, so it feels really good to have a go at it again! So how did it happen that I got a chance to review this whiskey before it's release?! 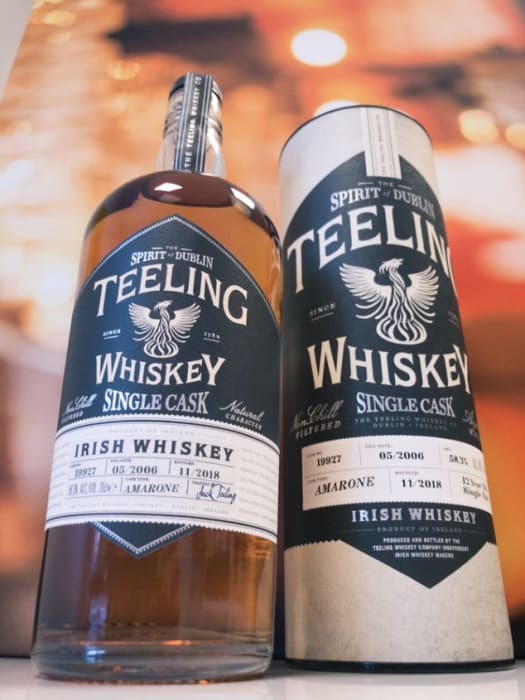 Well, when working the Linköping Whiskyexpo I had a little chat with Johan Strand, the newly appointed swedish Brand Ambassador for Teeling Whiskey. I simply asked him if there was any possibility at all to review it, and he said: "Sure! I'll fix a sample and throw it in the mail for you". It later turned out that it was easier for him to come by my place and drop the sample off (we live in the same city), so folks, this sample was hand-delivered! Now, the whiskey in question is 12 years old, a Single Cask Amarone that has spent it's first 10 years in a 1st-fill bourbon cask and has then been transferred into an (american oak?) amarone cask from the wine producer Musella where it has enjoyed a 2 year finish. The cask number is 19927 and the whiskey has been bottled at 58,4% ABV which is cask strength. The cask gave 256 bottles and if I've understood it correctly this is a Sweden-exclusive release! It will be launched this thursday (the 28th of february) as a web release at the state-monopoly, and you can view the product by clicking here. Ok, let's see what we have here! A delicate and fruity nose for sure! In the very top layer there is first of all lots of red jelly candy (think red bassets), below that we have a slight touch of apricot jelly candy, elder flower soft drink, overripe banana, and something kind of dry and slightly tanninic. In the layer below that, the most evident thing is a very nice vanilla creamyness intermingling with leather in the very distant, and just a tad of coconut milk and actually cucumber water! The last layer manifests itself in the form of malt that smells kind of ”chewy”. The strength can hardly be felt and/or is in no way ”too much”. Niiice! It starts of quite simple but robust with the main focus being tanninic and dry, but this is just for half a second. Then a very, very concentrated/focused taste of peel of redcurrants and blackcurants makes a mini explosion in my mouth. This is when the strength appears; the dryness evolves and along comes dry vanilla, leather with a touch of gun powder, which quickly moves on into elderflower- and lemon juice. There are also some kind of herbs here (but I can’t really put my finger to which herbs...), something a bit vegetal and something slightly ”bitter”. Wow, all of this happens in a short amount of time, say 20-30 seconds or so. After that, roasted almond paste, leather, and the alcohol rises beautifully in my mouth, creating an aftertaste that is definitely more-ish. It may seem obvious, but this is a dram with two evident styles; the bourbon matured part, and the wine matured part. If I generalize the bourbon part is somehow most evident on the nose and the wine part is definitely most evident on the taste with its mini explosion of dryness. It’s a bit of a pity that the dry part is quite quick. On the other hand this is complemented with a beautiful aftertaste! Of the Teelings I’ve had the pleasure to review so far, no one of them has left me dissapointed, nor does this one. And a SC for the price of 899kr at high strength and a decent age, well I’d say that this is a great ”bang for the buck”-whiskey! Finally, big thanks to Johan and the nice folks at TOMP for the great opportunity to review this whiskey before its release! For kind of weekly updates please make sure to follow my FB-page by clicking here, my instagram by clicking here, and my twitter-page by clicking here. Copyright © and All Rights Reserved on all tasting notes and text by SamuelWhisky and pictures and videos likewise belong to SamuelWhisky, unless stated. If you would like to use any such material that belongs to SamuelWhisky or associated with SamuelWhisky, please ask by sending me an email to samuelkarlssonorebro [at] gmail [dot] com and by stating the source. Revisiting Swedish Distillery Agitator Whiskymakare! Dear friends, followers and supporters alike! Today I had the great pleasure to spend yet another great day at Swedish distillery Agitator Whiskymakare! If you haven’t had the opportunity to read the article from my first visit, please do now by clicking here, and you will find out what makes Agitator such an interesting and exciting distillery. While the activities for my first visit was a bit more decided (getting to know, and helping out with, the production process) the activities of this visit were basically undecided. All of the sudden Oskars phone rang, a container with casks was just arriving! Yay, this was excactly what I was hoping for! The opportunity to really help out with some "daily" chores! The container was absolutely stuffed with over 200 casks. Casks made from new american oak with wave staves (räfflad insida). Wave staves gives the liquid more contact with the wood, and hence makes maturation go faster. We started emptying it at once! All in all it took the three of us around two hours to get the job done! Now that's a job well done! Mighty tired from moving all the casks, Christian and myself took a stroll around the warehouse sampling some exciting stuff that I will tell you more about in another article. After a while Oskar brought some much needed coffee, much needed indeed. Sadly we were getting close to the final minutes of my visit, but before driving back to the train station, I filled a 2nd-fill bourbon cask from an Islay distillery! Actually, it turned out that this cask was the first cask of the year to be filled! What an honor, and what a great feeling to fill and sign yet another cask at Agitator Whiskymakare! Well folks, that's it for this time. Big, big thanks to Oskar and Christian for the opportunity to visit once again, I can't wait for the next time!